How many instances of political satire or criticism can you think of throughout the history of art? And how does this art compare to the negative comments political candidates fire at each other in the twenty-first century? What is the current state of political cartoon art in the US? Is it on a par with Daumier’s works? France experienced three major revolutions in 1789, 1830, and 1848. The hard put upon working classes rebelled because of the corruption and greed of the French monarchy, the incompetence and corruption of the French legal system, and the placid acceptance of the status quo by the middle class. Daumier began making political cartoons in the 1830s during the reign of the corrupt King Louis Philippe. Political cartoons had begun to flourish during the late 18th century before the 1789 revolution and bloody Reign of Terror during which thousands were guillotined if they were suspected of any ties to the old regime of the Bourbon monarchs and court. The failure of the government to adequately reform French society led to the 1830 and 1848 revolutions, and it was a particularly ripe situation for political cartoons to once again flourish. Daumier’s unflattering depiction of Louis Philippe as a huge “Gargantua” devouring the resources of France’s beleaguered lower classes earned him a six-month prison sentence for insulting the king. Equally popular targets for Daumier were the greedy, unscrupulous lawyers and judges of the French legal system. This lithograph depicts lawyers and judges proclaiming their moral superiority while secretly picking each other’s pockets. Such unflattering portrayals of political figures made him a hero to the working poor. Connections Across Curriculum – Cartoons continue to play an important role in drawing attention to political and social issues. Students must use analytical and visual literacy skills to interpret what issues are being raised and why a cartoon may or may not be effective. Humor can be persuasive, so it is important to know one’s own point of view and not be swayed by clever images and wordplay (especially in these days preceding the presidential election). The National Gallery, Washington, has hundreds of Daumier’s cartoons! 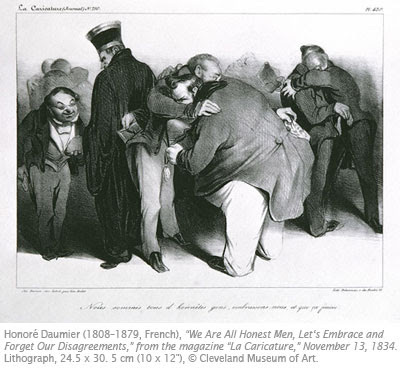 Click here to see other examples of Daumier’s political art in Davis Art Images.